On the heels of yesterday’s news that Fedor Emelianenko had finally become hellbent on arranging a scrap against Strikeforce champ Alistair Overeem, his longtime management team, M-1 Global, has issued a statement echoing their meal ticket’s demands. New York City, New York (August 25, 2010) Fedor “The Last Emperor” Emelianenko has made it clear that he would like to fight the current Strikeforce heavyweight champion Alistair “Demolition Man” Overeem as his next opponent later this year. Conversations have been taking place behind closed doors between M-1 Global and Strikeforce for some time and injuries, timing and differences of opinion have been roadblocks to putting Overeem and Emelianenko together. The roadblocks that once previously were preventing one of the most highly anticipated bouts this year seem to be disappearing. It appears The Emelianenko Express is quickly changing its course because M-1 Global president Vadim Finkelchtein claimed earlier this week they are mulling over a “lucrative” offer to compete in Japan on New Year’s Eve. However, the Orient appears to have gone out the window given what’s transpired over the last 24 hours. In addition, he implied they were looking to complete the FINAL bout on their current Strikeforce deal against Fabricio Werdum, who will be sidelined longer than the November/December date the Russians are adamant about meeting. Conversely, Kogan claimed last week they were “two-thirds” of the way done with a new deal to remain with their stateside partners. No word on how this blockbuster showdown would affect the final leg of “The Last Emperor’s” extension. Today’s announcement adds clarity to yesterday’s report, as Fedor didn’t specify which banner he would prefer to face Ubereem under. Thankfully, they have their sites set on Strikeforce, which would make it a championship affair that could go 5Round instead of just three. 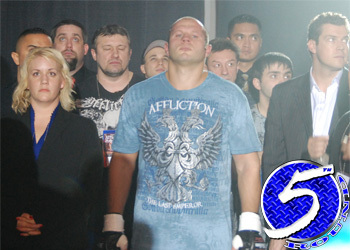 Although it’s absurd for most to believe that Emelianenko would be rewarded with a title fight immediately after having his 27-fight winning streak snapped, Strikeforce gave Brett Rogers a shot at the crown after getting slapped silly by Fedor in his prior outing. So the precedent has been set.